A little about myself. I am a retired Royal Navy Officer who now finds himself as a house husband and part time collector and dealer of Oriental ceramics. I served for over 20 years in the Royal Navy and took early retirement something like 20 years ago. I had a wonderful career, starting at the bottom and working my way up the promotion ladder until I reach the dizzy heights of Lieutenant Commander. I travelled all over the world with the Orient being my favourite part of the world which led directly to my love of Oriental ceramics. After leaving the RN I returned to my native North East of England and went to University to study to be a teacher. 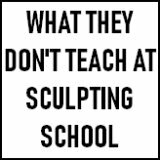 Teaching provided a very fulfilling second career and I was doing very well. Luckily for me I met and fell in love with my lovely wife. She quickly presented me with a beautiful baby boy and suddenly decisions had to be made with regards to child minding arrangements. Traditionally in the North of England, the man is the bread winner and the woman of the house stays at home doing all the housework, cooking, washing, ironing etc. As it happens my wife had a career of her own and we had the ‘who’s going to stay at home’ conversation. It was all pretty amicable really. I had already had one career, I could clean, cook, wash and iron with the best of them. Plus the fact that my wife’s career was worth more financially made the decision pretty easy really. She went back to work and I gave up teaching. For many years I have been in the very lucky position of being able to spend as much time at home with my son as I wish. I have done all the early years things, ie, building blocks for him to knock over, tumble tots and so on. I even took him to mothers and toddlers where I was the only male grown up present. get their head around the fact that my wife earned more than me and I was a better house wife than her. I have been very lucky bringing my son up, I have not missed a single school play or sports event. For that I am very grateful. As he got older and went to school full time I was left with time on my hands. I still had to do all the housework but needed something more to tax me. I do some supply teaching every now and again just to keep my hand in and have plenty of time to follow my son at his footballing events. My collecting started way back during my Naval career where I used to bring a piece back from every country I visited. 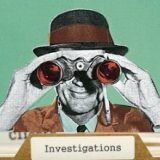 I add to it every now and again by scouring car boot sales and charity shops and attend the odd auction to see if anything interesting is available. 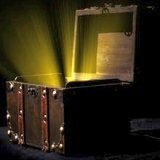 I do not spend lots of money, for me it is more about liking an item rather liking the value of the item, unless I can make a small profit. The plate I am trying to identify has been in my collection for years. It is one I picked up from a junk shop during one of my naval deployments to the Far East. I assume it is Oriental but I could be completely wrong. 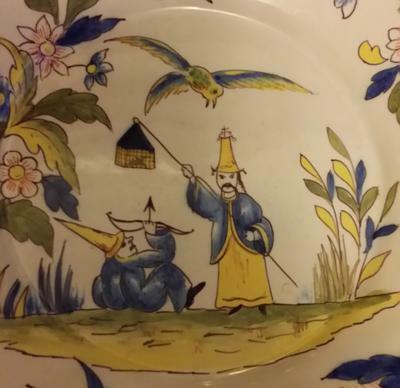 The figures are certainly oriental but it could well be a European plate with Oriental decoration. At first glance it looks like a Quimper plate but the subject does not fit. Nice article, thanks. I was fascinated. Great that you shared and wrote so well. Most likely to be Japanese post war. 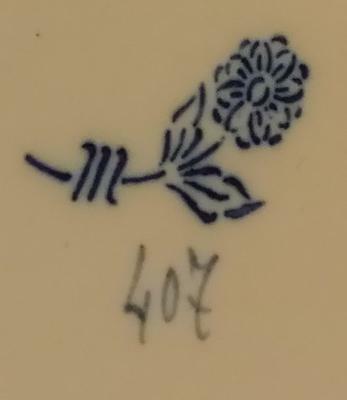 Now, the bad news is that I don't know this mark and my go to resources like my books and Gotheborg.com and also the excellent http://www.japanesepotterymarks.info/identification_marks.php did not have this mark. Hopefully we will have someone who knows this flower with two leaves and three stripes marking. I found a plate like this on ebay France described as Alfred Molin of Charolles. 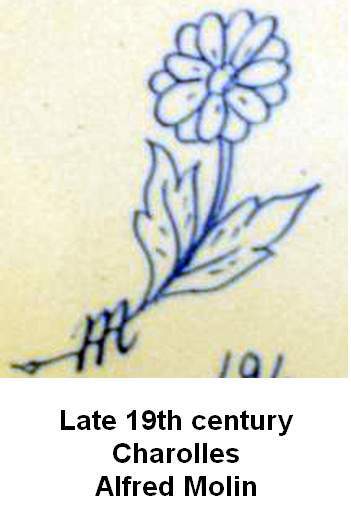 The infofaience.com site describes the mark as late 19th century (under "Other"). Note that the marks are not exactly the same. The three stripes are actually the letter M.
This to my eye is clearly the same mark apart from the fact that the one posted above by George looks a more 'stenciled' and perhaps modern version. 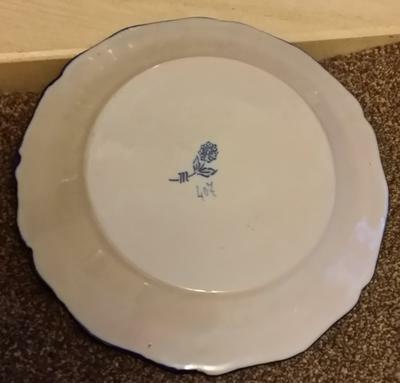 So the flower m pottery mark is not vintage Japanese output (as I wrongly suggested above) either a late 19th century Charolles Alfred Molin faience ware, or a more modern version of this older mark. Thanks for this. We have the right company, we just need to know their mark variations and dates.